Regina Gräff graduated with a Masters degree in languages and culture studies from the Ludwig-Maximilians-Universität in Munich/Germany. She has many years of experience living, studying and working abroad whether as exchange student or hosting exchange students, as teacher or educational consultant. In recent years, she gained further experience in international education while preparing her own children and students from a multitude of social and cultural backgrounds for education in a foreign country. 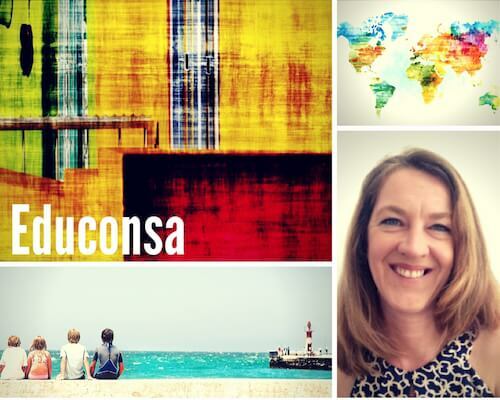 Born and raised in Germany, Regina is a serial expat and has worked as a teacher, advisor and consultant in various countries including the USA, Australia, Singapore, the UK and South Africa. Having travelled the world widely, she encountered many different cultures and has a strong interest in language learning, intercultural communication, educational leadership and management. Raising children never was and never will be easy and raising kids in a foreign country is an even more challenging exercise! A multitude of challenges arise when giving up on the usual family and community support network at home and creating a new life and social network when living abroad. Adapting to different cultures and lifestyles as well as learning new skills is, of course, part of life-long education but more and more critical now than ever before. Mutual understanding and awareness of critical issues is much needed from all of us. Living far from home, raising bilingual or multilingual children or even third culture children or educating diverse people creates specific challenges more than ever in our globalised world. We all know that education is key to advancement and we need to act urgently to create more awareness to live more harmoniously with each other. Today, we are confronted with an abundance of pressing social and educational topics dealing with diversity. The most acute challenges range from creating awareness about identity and different cultures/religions/social backgrounds, managing inclusion of gifted kids or children with special needs in schools and creating insights into power imbalances that have a horrifying effect with the creation of increased occurrences of racism and bullying all over the world. The world is getting smaller, but the challenges are increasingly complex! Sharing knowledge and expertise on educational themes as well as creating a network of like-minded people, parents, educators, professionals and the wider education industry to discuss and advance on issues concerning global education objectives is the main aim of the establishment of this platform.